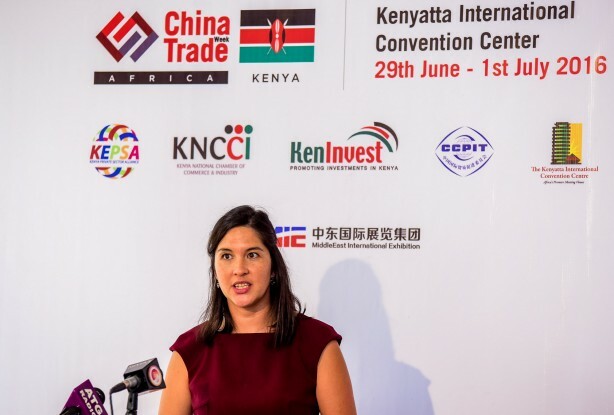 Over 400 Chinese exhibitors have signed up for second China Trade week scheduled for June 29 at the Kenyatta International Convention Centre (KICC) in Nairobi. The firms are from various industry sectors including building and construction, lighting, machinery, consumer electronics, energy, auto parts, furniture, home electronics, kitchen and bathroom, textiles, stationary and jewelry. Organized by MIE Events, a leading organizer of trade fairs in Dubai and China, the trade week is the only comprehensive China-focused trade event to be hosted in Kenya and the East Africa region. The 3-day event is designed to provide Chinese companies with a unique opportunity to meet, discuss and develop trading and business partnerships with both Kenyan entrepreneurs and the region’s business community across various commercial sectors. MIE Events, Managing Director, David Wang said it has selected Kenya because it is the most developed economy in Eastern Africa and also the economic, commercial, and logistical hub of the entire region. “The China-Kenya economic cooperation and trade in various fields has gained momentum over the years, and it is the very reason why we are holding the China Trade Week in Nairobi for the second time,” said Wang. This announcement comes in the wake of increased trade activities between China and Kenya, which continues to influence bilateral relations of the two countries. In the last decade, China has become Kenya’s largest source of Foreign Direct Investment (FDI) and second-largest trade partner. It is estimated that, in 2013, China’s cumulative direct investment in Kenya had reached US$474 million. During the same year, the bilateral trade volume between China and Kenya reached US$8.4 billion. International Events Director, Michelle Meyrick, said MIE Events are meant to create stronger ties between Chinese companies and the local business community looking to source for products and services from China. Over 16,500 trade visitors attended the 2015 edition and this year numbers could double. The trade show will feature a series of free practical and highly informative workshops and sessions on the best practices of doing business in China.